O.J. Simpson was famously found not guilty of the murders of his ex-wife Nicole Brown Simpson and Ron Goldman, helped by his "dream team" of defense lawyers, which was lead by Johnnie Cochran. But that wasn't the only famous case that Cochran ever argued. 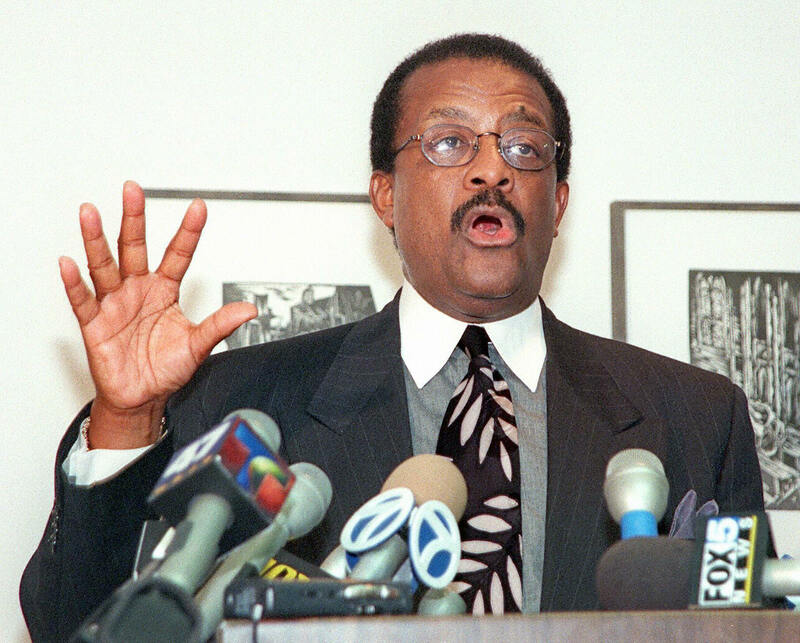 Johnnie Cochran defended Michael Jackson against allegations of child molestation in 1993 and 1994 — allegations that Jackson denied. This trial happened slightly before the famous "trial of the century," but it was a big part of how Cochran became a well-known defense lawyer famous enough to warrant a call when Simpson was bringing his defense team together. Cochran's connection to Jackson is downplayed compared to his work on the Simpson trial — but viewers of FX's miniseries The People v. O.J. Simpson: American Crime Story might remember an early scene where Cochran mentioned a "new pile of commotion" happening with Jackson in June 1994, right around the time of Brown Simpson and Goldman's deaths. As the New York Times reported in January 1994, a 14-year-old boy who accused Jackson of molesting him dropped his civil lawsuit after Jackson agreed to pay an undisclosed settlement out of court. After the settlement Cochran said, "The resolution of this case is in no way an admission of guilt by Michael Jackson ... In short, he is an innocent man who does not intend to have his career and his life destroyed by rumors and innuendo." You can watch Cochran's press conference about the case below. However, Gil Garcetti (the same LA District Attorney during the Simpson trial) told the New York Times that "the criminal investigation of singer Michael Jackson is ongoing and will not be affected by the announcement of the civil case settlement." But no criminal charges were ever brought up against Jackson since a grand jury did not indict him in May 1994, according to The Independent. In September 1994, the New York Times reported that prosecutors dropped their investigation into the molestation claims and chose not to move forward with the case because "primary alleged victim" would not testify. Throughout this period, Cochran remained one of Jackson's lawyers, but by the time the criminal investigation was dropped, he was already working on Simpson's legal team. In fact, the Times quoted Cochran as once again saying that "Jackson is still innocent and will always be innocent" while at a pretrial hearing for Simpson. Cochran's legal career may now be most associated with the phrase, "if the glove doesn't fit, you must acquit," but that trial was hardly his first time working with a client in the spotlight.